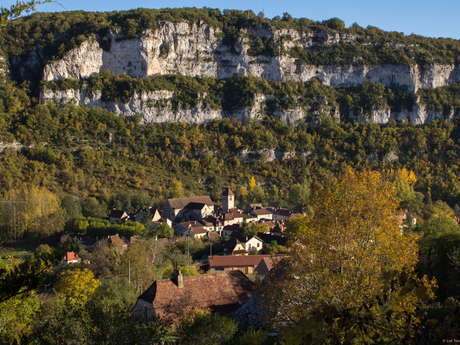 Marcilhac-sur-Célé looks tiny beside the towering limestone cliffs ! Marcilhac-sur-Célé is on one of the Santiago de Compostela Ways (variant 651 of the GR65). Organised around its abbey whose Romanesque church ruins have kept their austere beauty, this village is very peaceful and enjoys the cool freshness of the banks of the Célé. It looks minuscule beside the towering limestone cliffs ! 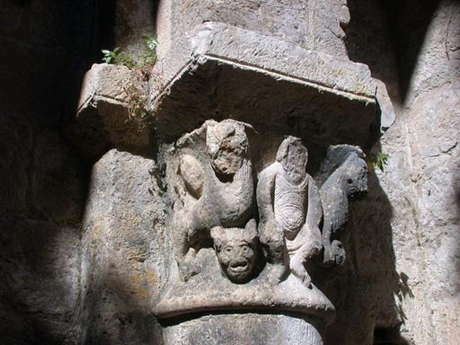 Its rich abbey, contemporary with Conques (late 11th C.), and completed towards the end of the 12th C., had Rocamadour in its possession for a long while, at a time when the pilgrimage had not really developed. Created by monks from Moissac in the 9th C., right from the start it welcomed pilgrims on the way to Santiago. From the cluster of buildings remain some Romanesque ruins, the Gothic reconstruction and especially the lovely Chapter Room and its sculptures.